The Overview is you new landing when working in the client manager. It strives to offer you, in a glance, an overview of the clients you have in Briox and the status of their accounts; it also brings to the surface the functionality you most often use, aiming to drastically diminish the number of clicks when working with your clients. Quick setting, sums and Filters also help administrators gain an overview. 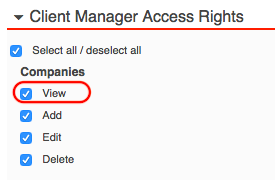 When creating the Client overview, we created a new company viewing right for the Client manager. This right enables consultants to see all the companies in the client manager or none. This way the administrators can control what each consultant sees by limiting consultants to the overview. However if the new right is not ticked on your consultants, they will not be able to see any companies in the Client Manager under Companies. They will however be able to see them in the Client Overview! To help you find the invoices you are looking for and limit your search, a period filter looking at the invoice date, has been added to the following invoice lists. A new functionality has been added to the document Archive to heighten security. The system administrator or application administrator can now mark certain senders as trusten and ban others form mailing documents to their archive.